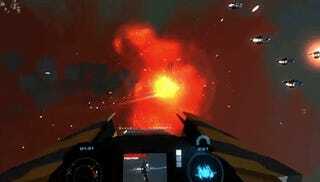 So last year we got a look at a game called Enemy Starfighter. By combining the space action of Lucasarts' classic X-Wing series with both the visual style and strategy of Homeworld, it looked too good to be true. And hey, it still might be, but development continues. Just look at this trailer. Pretty damn slick for such a (relatively) small production, but it's ticking all the boxes: space action, gorgeous visuals, a layer of strategic command over the top and, best of all, Oculus Rift support. It'll be playable at PAX East, with Oculus Rift attached, so if you're there go check it out!